Often the use of local rock material for construction purposes is overlooked in engineering, which could reduce costs in terms of procurement and transport, as well as being more environmentally friendly by minimising the introduction of foreign materials. The rock materials at and around the site of a rock vault for the Matjiesfontein Geodesy and Earth Observation Observatory (MGO) were tested to determine if local materials may be used for construction purposes. In order to do this, strength and durability tests were conducted according to several South African National Standards (SANS). Slake durability was also tested where the potential of certain rock types, such as tillite of the Dwyka formation and shale of the Karoo Supergroup, typically slake/disintegrate into long angular fragments. This angular fragmentation during crushing of rock into aggregate for concrete also affects the workability of concrete in a fresh state. Concrete design using crushed local rock material was conducted to analyse performance and to establish a mix design that would be sustainable throughout the lifetime of the project. Tillite of the Dwyka formation was found to satisfy all test prerequisites best with minimal slaking due to the arid conditions at Matjiesfontein. Quartzite (Table Mountain Group) is very durable, but further testing for alkali-silicate reactivity is needed. All concrete cube tests accomplished the 40 MPa cube stren,gth, which was the design requirement, but problems arose in the workability of the concrete when river sand from nearby non-perennial rivers was used as fine aggregate in the concrete. This relates to too many particles of the same size within the sand. The Matjiesfontein Geodesy and Earth Observation Observatory (MGO) will be the first of its kind in the southern hemisphere and will, amongst other collocated instruments, be home to a Lunar Laser Ranger (LLR). The LLR is a large laser telescope that emits laser beams in the direction of the moon, and these are then reflected from retro-reflectors that were placed on the moon during the Apollo programme. This is used to determine the distance to the moon, and forms part of an international network of similar geodetic stations in the northern hemisphere that investigate discrepancies in earth-moon relationship models. The validity of Einstein's theory of relativity can also be analysed with such data. Uncertainties in data collected from gravimeter stations around the world confirm that, like the tides at sea, the earth's crust experiences tidal movement of about thirty centimetres per day (Combrinck 2012), which can be monitored using highly sensitive equipment such as permanent gravimeters, seismographs and accelerometers. These instruments need to be fixed directly onto the earth's crust and housed in a structure that offers a stable environment, uninfluenced as far as possible by external impacts. A vault built into a rock face or hill best serves this purpose and will be built at the MGO where a gravimeter, seismograph and accelerometer will be installed. Understanding the rock mechanics and the terrain from a geotechnical perspective is the first step in preparation of construction of the vault. The access road to the MGO site is also in need of repair, as vehicles transporting expensive and sensitive equipment need to travel to the site. The use of local material for construction and concrete design could reduce procurement and transportation costs, as well as be more environmentally friendly by reducing the introduction of foreign materials. If one could use excavated material and then build on the area that had been excavated, the essence of sustainability could be accomplished at a fraction of the cost, given that the equipment needed for excavation and construction (such as a small-scale crusher, sieve, vehicles, jack-hammers, etc) are not too expensive. 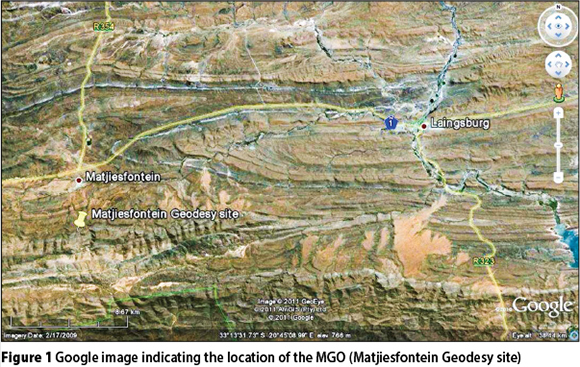 The site of the MGO is located in a small depression at the foot of the Witteberg mountain range, about five kilometres south of Matjiesfontein village in the Western Cape (South Africa) on the boundary between the Cape and Karoo Supergroups (Figure 1). The typical rock types are mainly quartzite (Table Mountain Group), sandstone (Table Mountain Group), tillite (Dwyka formation) and shale (Karoo Supergroup). 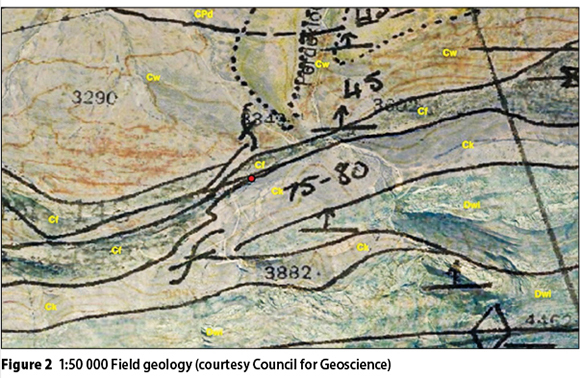 A portion of the 1:50 000 geology field map, obtained from the Council for Geoscience, is shown in Figure 2, where CPd is the Dwyka formation, Cw the Witpoort formation, Cf the Floriskraal formation, Ck the Kweekvlei formation and Dwi the Witpoort formation. These rock types all exhibit their own characteristics and potential risks when used for construction purposes. Although quartzitic sandstone of the Cape Supergroup (Peninsula and Skurweberg formations) is good when used as concrete aggregate and is extensively used in the George, Bredasdorp and Knysna regions (Cole 2011), quartzite, when strained, does pose a risk for alkali-silicate reactivity (Alkali-silica reaction in concrete, n.d.) when used as aggregate in concrete. The following sections describe methods used in determining strength and durability of the different rock types through a slake durability and a 10% Fine Aggregate Crushing Test (10%FACT); and performance of concrete when local construction materials are used as aggregate and analysed by means of cube strength. This is followed by a discussion on what potential changes could be made in order to improve the project, followed by a summary and conclusion. In the slake durability test, seven lumps of rock, from each of the four different rock types (quartzite, tillite, sandstone and shale) were placed in four different bins. The assembly was rotated on an axle for five wet/ dry cycles (1 cycle - wet for 12 hours during the day and dry for 12 hours during the night). During the wet period of a cycle, the bins were partially submerged in water so that when stationary, all lumps of rock weresubmerged, and then for the dry period of a cycle, the water was completely drained. After the five wet/dry cycles were completed, the mass of rocks left in the respective bin was compared to that of their original mass. This data was then used to calculate the percentage of deterioration that each rock type had undergone during the test. Photos before and after were also taken for visual comparisons in degradation. The test apparatus consisted of four bins, each with a width of 100 mm and a diameter of 250 mm (Figure 3). The circumference of the bin consisted of Polyvinyl Chloride (PVC) pipe (250 mm diameter), with a matrix of 20 mm diameter holes, and closed on the sides with 13 mm mesh. Each bin was positioned on an axle and rotated at five rotations per minute by a motor. The slake durability apparatus (Slake n.d.) is an apparatus that conforms to the American Society for Testing and Materials (ASTM) D4644 (1998), used to test the slake durability of rocks via a rotating drum mechanism. This apparatus is used to test the disintegration of the rocks into small particles. This is not an accurate estimate when considering rocks such as those from the MGO site. Shale, in particular, breaks down into particles/fragments of many shapes and sizes, so if one had to use the ASTM D4644 (1998) standard, shale may seem more durable than some of the other rock types, which would be an inaccurate representation. Because the slaking of disintegrating rocks into different shapes and sizes was to be tested, a test mentioned in Brink (1983) was adapted and an apparatus was built that would release < 20 mm particle/lump sizes. Unfortunately, in Brink (1983) only a visual evaluation is done by comparing before-and-after photos to estimate which materials had undergone more weathering, and no physical mass comparisons between before-and-after the apparatus were run. In Brink (1983), however, tests were also done by substituting water with saturated sodium sulphate and sodium hexametaphosphate known as Calgon (a dispersive agent). Unfortunately, such tests in different solutions were not possible due to the lack of availability of mixtures (±30 L of each mixture) and cost implications. Although comparative results were found in Brink (1983) on the slaking of samples into particle sizes, actual tabular results, which would have enabled comparison to a test similar to the one conducted, i.e. breakdown percentages of the slaking of disintegrating rocks into different shapes and sizes, was not possible. During the 10%FACT test two samples of each rock type were tested for their 10%FACT value. One sample for each rock type was tested under dry conditions and the other under wet conditions (soaked for 24 hours). The purpose of the 10%FACT test was to determine the force required that would yield 10% fines (10% of the original specimenmass) in a dry and wet condition. 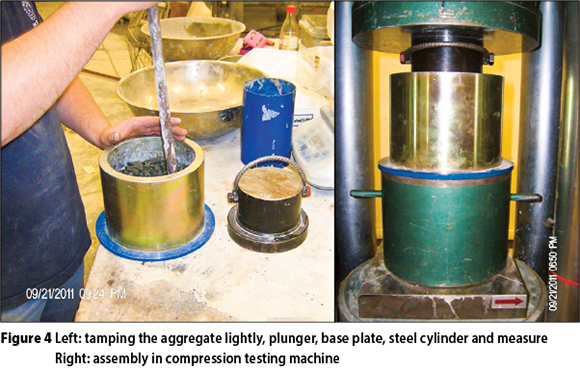 The way in which the test was done, was to crush 9.5 mm aggregate in a steel cylinder (in the compression testing machine) to yield a percentage fines between 7.5% and 12.5% and record the force required to produce this percentage (Figure 4). The force obtained for wet and dry conditions was then expressed as a percentage (wet-to-dry ratio). The general necessary wet-to-dry ratio for the present 10%FACT specification for road aggregates is a minimum of 75% (Thothela et al 2011). According to the old South African Bureau of Standards 842 (SABS 1994), the sieves used as part of the apparatus are 13.2, 9.5 and 2.36 mm sizes, whereas in the new South African National Standard 5842 (SANS 2006) the sieve sizes are 11.2, 8.0, 2.8 mm respectively. Due to a lack of the relevant sieve sizes required by SANS 5842 (2006), the sieve sizes used during the test were according to SABS 842 (1994), while the method used was that as set out in SANS 5842 (2006). Cube strength was used to determine the strength of the concrete when using local materials from the Matjiesfontein site. The 28-day cube strength aimed for was 40 MPa and the test was conducted according to Addis (1998: 23-25). An assumption, from the durability testing, was that shale and sandstone would not make good coarse aggregate for use in concrete, and consequently only tests using quartzitic sandstone and tillite as coarse aggregate were conducted, with river sand as fine aggregate. The relative densities were obtained using the pycnometer method as shown in SANS 5844 (2006). Four mixtures (three cubes for each mixture) with a water:cement ratio (W:C) of 0.55 (Ramat 2012) were designed, trialed, adjusted and tested in order to achieve the 40 MPa cube strength. The first two concrete designs used Malmesbury sand (commonly used in South Africa and often called building sand) as a fine aggregate, and quartzitic sandstone and tillite as coarse aggregate respectively. The second two also contained quartzitic sandstone and tillite respectively, but instead of Malmesbury sand, ordinary river sand was sieved (< 4.75 mm) and used as fine aggregate. Tables 1 to 4 show the four different concrete designs tested. The slake durability test revealed that quartzite and tillite were the most durable materials, losing only 10.5% and 16.5% of their initial sample mass respectively. 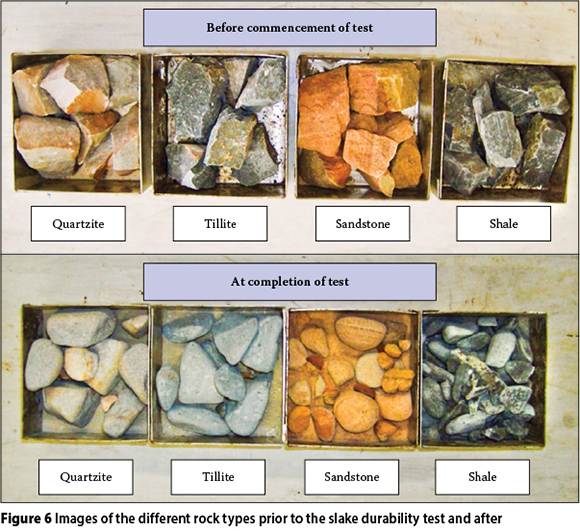 As illustrated on the graph in Figure 5, sandstone and shale proved considerably less durable than quartzite and tillite, losing over half their initial mass during the five wet/dry cycles. Figure 6 shows what the samples looked like before and after the test. Quartzite showed little breakdown and weathering, and much of the material collected in the container underneath the basket throughout the test was in the form of silt-size particles similar to dust that had degraded through mechanical interaction with the surfaces of the apparatus and other lumps of rock. The quartzite lumps generally remained in an angular form, but were rounded at the edges. Like quartzite, tillite showed little breakdown, and the material recovered in the container under the tillite bin consisted of tiny flaky pieces of rock material with a "powderish" appearance. The tillite lumps also remained angular and rounded at the lump edges. Sandstone showed the most weathering. Of the material collected under the sandstone bin, most was in the form of sand particles. The sandstone lumps progressed from being angular in appearance to rounded small-to-medium size lumps, many of which were small enough to fall out of the bin into the container. Shale, as was expected, broke down in different shapes and sizes, although with the tumbling action of the wheel they were rounded at the edges. In nature this would not necessarily be the same, and the slaked-off fragments would be angular and sharp, but the test does reveal the extent to which typical shale rocks degrade. Far less silt-size particles and flaky pieces of material were found in the container than for the other rock types. 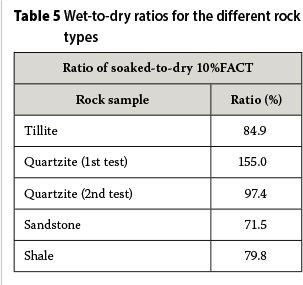 Figure 7 shows the 10%FACT value for each rock type in wet and dry conditions. All of the rock types, except for the first test for quartzite, had a larger 10%FACT value in the dry condition than under wet circumstances. As can be seen in Table 5, tillite showed a ratio of 84.9%, sandstone 71.5% and shale 79.8%. 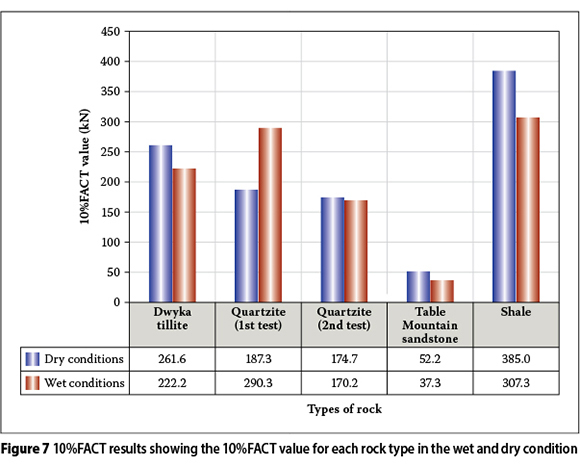 Interestingly, the 10%FACT value for wet conditions for quartzite was initially significantly higher than that for dry conditions, producing a ratio of 155% wet-to-dry 10%FACT. Therefore a second test was done yielding a wet-to-dry ratio of 97.4%. According to Thothela et al (2011), the minimum dry 10%FACT value required is 210 kN. Tillite and shale both satisfied this prerequisite, whereas sandstone and quartzite did not. 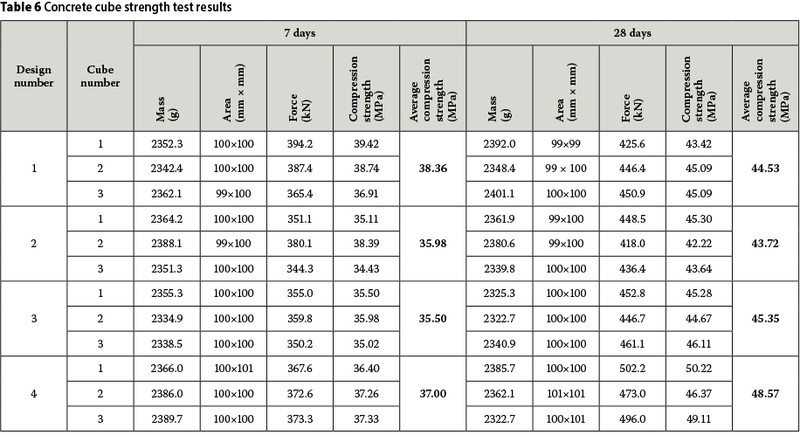 The concrete cube test results are summarised in Table 6. Tillite's slake durability results were initially surprising, because greater slaking and breakdown of material were expected, but according to Brink (1983) it was discovered that in arid regions, such as where the MGO is situated, no problems were reported concerning this physical breakdown, though exposure may disintegrate the material to an extent. This is probably because less rain occurs in the Karoo, and the Matjiesfontein region is far less humid than areas closer to the east coast where drastic breakdown of tillite is reported. The manner in which shale slakes into fragments of different shapes and not into silt sizes indicated that shale, although impermeable to water, contains internal bedding planes along which the lumps break. Shale disintegrated less than sandstone, probably because the sandstone lumps tested were initially weathered to a larger extent and much softer than the shale. A possibility is to build an apparatus closer to that as described in ASTM D4644 (1998) and to conduct the test again, and then compare results. Another possibility is to use Calgon (dispersive agent) instead of water, as described in Brink (1983), in order to conduct a similar test and visually evaluate in more detail. Although sandstone showed a ratio < 75 %, recent studies in South Africa by Thothela et al (2011) suggested that a relaxation in the specification may be required. The reason for the ratio being < 75% for sandstone is most likely because the rock samples that were crushed and used in the test had been collected at surface where the site is located, and where they had already been exposed to initial weathering. Although the sandstone does not meet the 210 kN precondition in the wet or dry condition, further testing of less weathered sandstone would be recommended. The result of the first wet 10%FACT test for quartzite was significantly higher than the 10%FACT value for the dry test. This was peculiar, because only materials pre-coated with bitumen show such tendencies, due to their ability to reject water or decrease the ability of water to be absorbed into aggregate (Thothela et al 2011). It was understandable that the quartzite could repel moisture due to its density (closely compacted particles with no voids) and hardness. For it to have such a high wet-to-dry 10%FACT ratio of 155%, however, the only conclusion that could be drawn was that the water acts as an adhesive agent similar to that of pre-coating, resulting in high wet-to-dry ratios. It was suggested that the result be considered inconclusive, and that the 10%FACT test for quartzite be redone, because no results yielded a wet-to-dry ratio greater than 120% (a value only achieved using precoated materials (Thothela 2011)). This was done, yielding a more reasonable wet-dry ratio of 97.4% which, according to Thothela (2011), is normal for quartzite (close to 100%). Possible precautions should be taken when procuring materials on site to ensure that only materials showing little or no weathering are used. A possibility is to start a quarry on site, but this would be inadvisable, because it would dramatically affect the aesthetic value which the local Matjiesfontein community wishes to preserve. All the cubes tested for strength achieved the 40 MPa design prerequisite at 28 days. According to Croukamp (2012), 40 MPa concrete may be unnecessary, as the concrete will not be subjected to high loading, and strengths of 25-30 MPa may well be sufficient. In order to decrease the overall concrete strength, the W:C ratio may be decreased, and a cheaper design could be achieved in that less cement would be used. 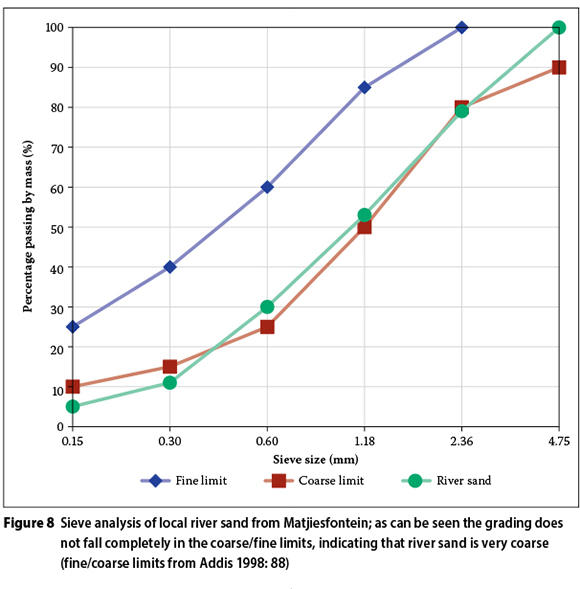 Problems arose when local river sand was used as fine aggregate, in terms of workability. Slump tests of the concrete in a fresh state indicated slumps in the region of 10 mm to 40 mm, whereas 75 mm was the minimum slump specified. This value is typically used in construction (Ramat 2012). As can be seen in Figure 8, the local river sand is very coarse, making the mixture abrasive and affecting its workability. As indicated in Addis (1998: 86-87), river sand on the banks of rivers (as the local river sand tested) often contains particles of roughly the same size. This is not conducive to workability, because materials have a large deficiency or excess of a certain size fraction. A possibility to remedy this situation may be to design and test a concrete mixture that contains a superplasticiser, or another admixture, to increase fluidity in the concrete (Illston & Domone 2001). Mix designs 3 and 4 (Tables 3 and 4 respectively) indicate very high cement content, which may prove problematic in large volumetric pours, and significant heats of hydration could result. The suitability of a concrete mix requires much more than strength testing. Other properties such as the Oxygen Permeability Index, Absorptivity and Chloride Conductivity still need to be examined. Alkali-silicate reactivity is a risk when using quartzite as aggregate in concrete, but only if the quartzite is highly strained (Lee n.d.). In order to establish whether the quartzite is strained or not, petrographic analysis of a quartzite thin-section may be used (Verryn 2013). An additional test that is widely used is the mortar bar test that may be conducted in 16 days (Obla 2005) in order to fully determine if the aggregate is reactive. Generally most of the tests conducted indicated that quartzite and tillite are the most suitable materials for construction purposes at the MGO site. 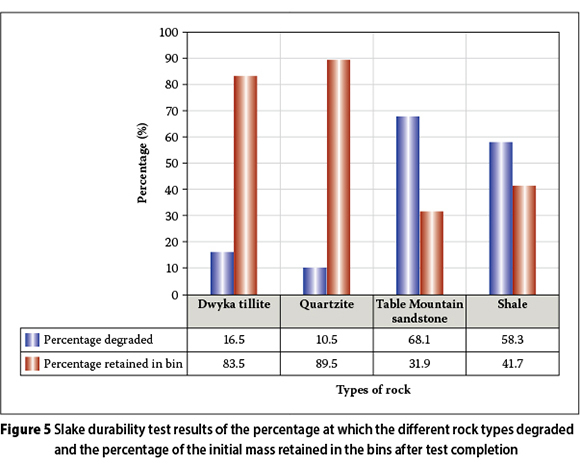 The slake durability test showed that quartzite and tillite only degraded 10.5% and 16.5% from their initial masses respectively in five wet/dry cycles. 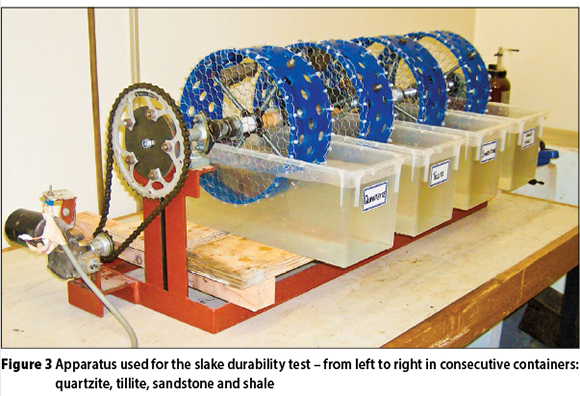 A recommendation is to build another rotating mechanism that conforms to the slake durability apparatus (Slake n.d.), and conduct tests again for the slaking of rocks to sand- and siltsize particles, and compare these to the test conducted. Another possibility is to conduct the test using a dispersive agent instead of water, as mentioned in Brink (1983). The first 10%FACT test for quartzite resulted in abnormal figures and was therefore inconclusive. The second test, however, had more normal results, with a wet-to-dry ratio of 97.4%, but did not achieve the minimum required 10%FACT value of 210 kN. This would render it unsuitable for construction if only the 10%FACT test is used as the accept/reject criterion. Along with tillite, shale fulfilled the 10%FACT test prerequisites (wet/dry ratio of 75% and 10%FACT value greater than 210 kN), but shale would not be recommended as a construction material for the purposes of the project due to its known slaking properties. A recommendation in the light of the 10%FACT test, including redoing the test for quartzite, is to conduct the test using unweathered or partially metamorphisised sandstone (quartzitic sandstone). This should increase the 10%FACT value above 210 kN, but again the recommendation is not to use sandstone, due to it disintegrating properties (disintegration into sand and silt sizes). All concrete cube tests achieved the design value of 40 MPa cube strength, but when the local river sand was used as fine aggregate in the concrete, problems arose in the workability. This was because the river sand is too coarse and contains too many particles of roughly the same size. Although 40 MPa concrete was the design value, after further discussion, this prerequisite may possibly be lowered to 25-30 MPa, which will reduce costs. Along with further strength testing of cubes containing super-plasticiser, a recommendation is to examine other concrete properties such as the Oxygen Permeability Index, Absorptivity and Chloride Conductivity. In order to determine if quartzite poses a risk of alkali-silicate reactivity in the concrete, it is recommended that thin-sections of quartzite from the site be analysed to determine if the quartzite is strained, and if it is, to conduct additional mortar bar tests. The authors would like to thank Stellenbosch University for providing the technical staff and facilities necessary for the research to be conducted. Staff members Charlton Ramat, Matteo Dal Ben, Colin Isaacs and Adriaan Fouché, among others, are thanked for their technical assistance. We hereby also acknowledge DST, NRF and AEON's Inkaba yeAfrica Programme's financial support during 2012 and 2013. This is an Inkaba Publication No 76. PETER VAN WYK obtained his Bachelor's degree in Civil Engineering in March 2012 at Stellenbosch University, and is currently enrolled as a Masters student at the same university, focusing on geotechnical properties of rock materials at the Matjiesfontein Space Geodesy and Earth Observation Observatory. LEON CROUKAMP obtained his BSc, BSc (Hons) and MSc from the University of Pretoria, and is currently enrolled as a PhD student at Stellenbosch University. He worked as an Engineering Geologist and GIS Analyst at the Council for Geoscience in South Africa for 23 years, during which time he was also President of the South African Institute for Engineering and Environmental Geologists (SAIEG) for a term of four years. Currently he is a lecturer in GIS and Engineering Geology at Stellenbosch University.